John Deere Body Parts - John Deere #TY26020 Yellow Touch Up Paint - 0.4 Oz. A 0.4 oz. 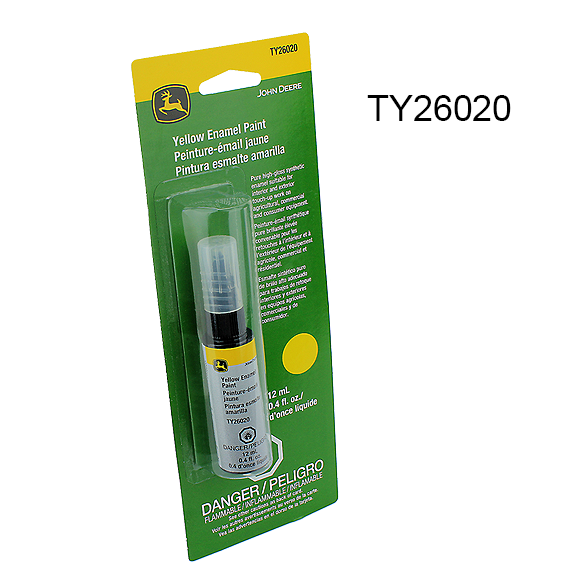 (12ml) container of genuine John Deere #TY26020 Yellow Touch Up Paint. This pure, high-gloss, synthetic enamel is suitable for interior and exterior touch-up work on agricultural, commercial and consumer products. Updated application technology allows easy application where a nick or scrape needs touch-up paint, but does not require spraying, and is John Deere engineering approved. Has improved durability, gloss, and appearance. Ideal for combines, tractors, implements, lawn and ground care products, toys, and other rolling machinery. A genuine John Deere Original Equipment (OEM) part.